As CSC discovers new disease and uncovers breakthroughs on existing conditions, our clinical team faces a growing challenge: How do we provide parents with the best information available to care for children with complex medical needs? CSC expanded the popular “Family Education Day” series two years ago to cover more diseases and touch more families. We now hold an average of 10-12 education days per year where families, clinicians, and researchers come together in common purpose. Yet, question and answer sessions often reveal more questions than answers for families with vulnerable children. The CSC team dreamed of a handbook format that could be replicated for the most common disorders treated at the clinic. 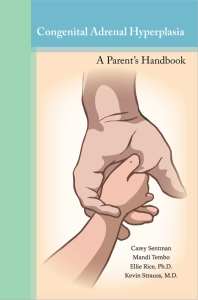 The handbook could serve as a vital reference guide, empowering parents with quick answers to their child’s care that are grounded in the most current clinical guidelines and research findings. 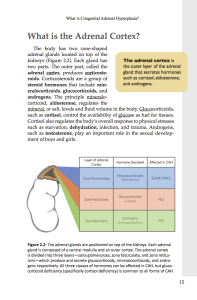 Thanks to the Howard Hughes Medical Institute, such a handbook came to life this year for a disease called congenital adrena l hyperplasia or CAH. We are LONG overdue in sharing this wonderful news, and Franklin & Marshall College wrote a piece last April as the project was developing: http://www.fandm.edu/news/latest-news/2014/04/14/from-classroom-to-pressroom-students-pen-handbook-on-disease. For now, the book can be obtained through CSC or Franklin & Marshall, but the team hopes to make it available for purchase online. Like so many collaborative projects between CSC and Franklin & Marshall, undergraduate students made the crucial leap to solving real-world problems – a powerful lesson in application that will help them no matter their chosen field. “There is no greater joy as a doctor and educator than to see bright young students interacting with the patients and families we serve, tackling complicated problems and building trust. We could not have asked for a better outcome for our students and families,” says Dr. Strauss. MANY thanks go to Professor Ellie Rice, Carey Sentman, Mandi Tembo, and to all the other students who worked tirelessly on the book. Most of all, we thank the families who help to make this work possible!